Today is my Jewish birthday. It's a big one - I am now forty years old. The Mishnah in Pirkei Avos states that forty is the age of understanding. According to some, that means that I can now study kabbalah! But I don't think that I'm going to switch from being a rationalist to a mystic. This has been a big year for me. 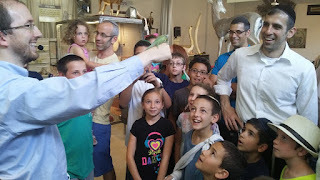 With much help from Hashem and others, I finally fulfilled a dream that I have had since childhood, and opened an animal institution - The Biblical Museum of Natural History. I also finally published a book that I started writing when I got married fourteen years ago, The Torah Encyclopedia of the Animal Kingdom. The next work that I hope to publish is a book about rationalist Judaism. It will include my various monographs on this topic, as well as a lengthy discussion of the topic of rationalist vs. mystical Judaism in general, and an important monograph that I have yet to write, on rationalist vs. mystical approaches to Torah study. In this post, I would like to share some thoughts which I plan to include in a preface to this book. It might seem odd that someone such as myself is studying and writing and teaching about rationalist Judaism. After all, I am an amateur zoologist with a lifelong passion for the animal kingdom, and my regular job is running the Biblical Museum of Natural History. What is the connection between animals and rationalist Judaism? 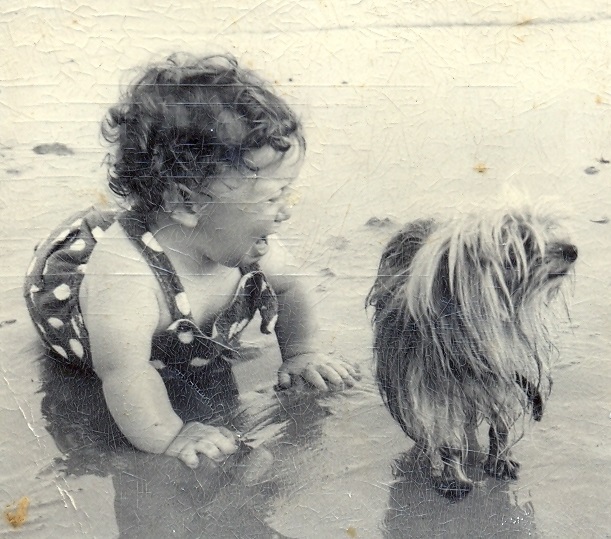 My first encounter with the animal kingdom. Not very positive. In fact, there was a direct trajectory from one to the other. The fascination that the animal kingdom holds for many people, including myself, is that it is extraordinary, and simultaneously real. It is extraordinary in its diversity of shapes and sizes and colors and forms and behaviors. Like many people, I am therefore drawn to the more unusual and exotic animals. At the same time, there is the fascination of these creatures being real. Animals are not abstract concepts – they are living and breathing creatures. Therefore, while I was always interested in virtually all animals, there were some that were particularly interesting. Dinosaurs, for example, while no longer living, are extraordinary creatures that are still very real in that their bones can be seen and touched. And I have also long been interested in the distinction between real and imaginary creatures. Is there such a thing as Bigfoot? The Loch Ness Monster? There are some cryptozoological creatures whose existence cannot be absolutely determined one way or the other, but with others we can be sure that they do not exist. Because of these interests, when I began exploring the intersection between Torah and the animal kingdom, I was particularly drawn to certain topics. 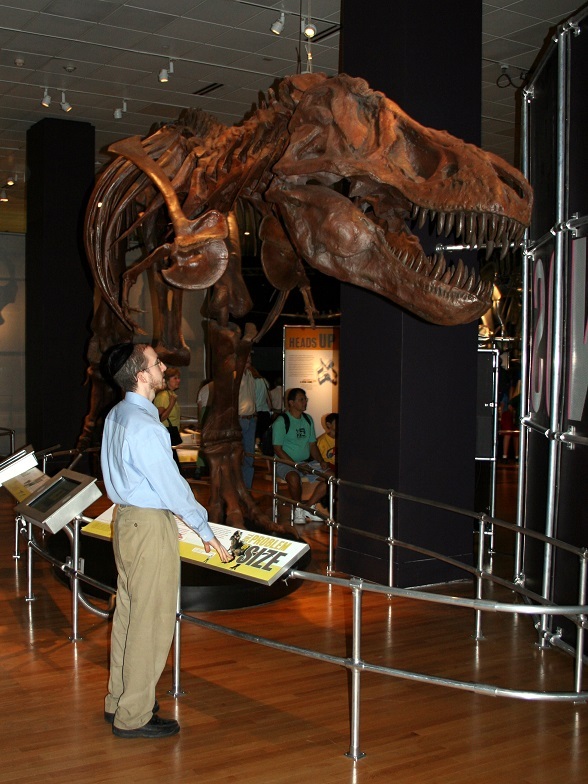 Dinosaurs are real and exciting – how do we reconcile them with the Jewish calendar? There is overwhelming evidence that all animals are descended from a common ancestor – how do we reconcile this with the Torah? Salamanders that are generated from fire and mice that grow from dirt are captivating notions, but they certainly do not exist – how do we account for the Gemara’s descriptions of them? The skeleton of a Tyrannosaurus rex. I was naturally fascinated by these questions. And due to the scientific approach that I inherited from my father, of blessed memory (who was an outstanding scientist, as well being extremely intellectually honest), I couldn’t accept that dinosaurs never existed, or that they lived just a few thousand years ago, or that spontaneous generation really does take place, or that Chazal never actually believed in it. These questions intensely bothered me. I was also distressed by the inability of my teachers in yeshivah to deal with them. And so I was thrilled when I got to know Rav Aryeh Carmell, ztz”l, who introduced me to the approaches of Rambam, Rav Hirsch and others who provided reasonable approaches to such topics. They stated that the account of Creation need not be taken entirely literally, and that the Sages of the Talmud, notwithstanding their greatness in Torah, held the beliefs about the natural world that were common to their era. I published books to share these approaches with others, who were likewise fascinated by the subject matter and relieved to find reasonable approaches. Then, as is well-known, my books on these topics were banned. This came as a great shock to many people, including myself. To be sure, I knew that these approaches were not exactly common in the yeshivah world. But how could they be branded as unacceptable heresy? To my mind, these approaches were (a) of impeccable credentials, (b) unobjectionable, and (c) obviously true! How could my ideological opponents, who were far greater in Torah learning and intelligence than me, believe these approaches to be inauthentic, entirely unacceptable, and absolutely false? How could they deny that there was an age of dinosaurs, and not even be interested in thinking about this question? How could they insist that there are creatures that spontaneously generate? I embarked upon a long process of analysis, study and reflection in order to understand this. What I finally understood was that there are two fundamentally different worldviews regarding epistemology – the nature of knowledge and where it comes from. These are the rationalist and the non-rationalist approaches. They are so far apart from each other that if a person is embedded in the non-rationalist approach, no matter how learned and intelligent he is, the rationalist approach will seem to be entirely false and heretical. And yet, as I discovered in the course of my studies, the rationalist approach has a rich heritage to it. It was most prominently presented by Rambam, but it was dominant among the Rishonim in many ways. It is fascinating and disturbing to see how an approach that was once dominant in Jewish thought has declined over time to the point that there are great Talmudic scholars of today who do not realize that it ever even existed and vehemently oppose it. Yet this approach presents an authentic and effective lifeline to the many people who have been seriously turned off by the prevailing modes of thought in the Orthodox Jewish community. as they encounter an amazing three-horned chameleon! I would like to take this opportunity to thank all of you, dear readers, for your interest and support of my work. May Hashem bless you with health, happiness, and success! Very well written. I have not a word of criticism to say. Do you correspond with Dr Gerald Schroeder? Perhaps the two approaches you speak of are linked to the different approaches to truth discussed in Prof. Marc Shapiro's new book "Changing the Immutable." Many happy returns, R' Slifkin, from an almost exact contemporary. I think the book on rationalism will be much appreciated by a modern orthodox community that increasingly gets frustrated by a dogmatic approach to knowledge based only on revelation. Mazal tov, R' Natan, on reaching this important milestone. May you have many more productive years. While I certainly agree with your defense of rationalism, I would not phrase it as some need to save it from extinction. The ideology fashionable today in the Hareidi world is not written in stone. As increasingly more are turned off by the intolerance and ignorance of yeshiva teachers and leading Hareidi figures, some change is inevitable - particularly when sources of knowledge are so readily available. The question may be, will Hareidism implode before it has a chance to evolve in response to modern pressures? This matter is not wishful thinking, it is a reflection of the predictable self-destruction built into the concept and practice of 'torah-only' for the masses. That Maamar applies to excluding Mitzvos & Maassim Tovim. Rabbi Slifkin wrote: "According to some, that means that I can now study kabbalah! But I don't think that I'm going to switch from being a rationalist to a mystic." I beg to differ on this point--just as a person who focuses on halachah can't simply ignore aggadic sections of the Gemara, the I believe the same could be said about rationalist and kabbalah explanations. Kabbalah is already so entrenched in the liturgy and practice, that it is a part of the Torah that shouldn't be ignored. I am very grateful for Rabbi Slifkin's contributions, and wish him many more productive years. >> Kabbalah is already so entrenched in the liturgy and practice, that it is a part of the Torah that shouldn't be ignored. While you are certainly correct that historically speaking Kabbalah has been accepted, that is no reason to give it any credence as a part of "our" Torah today. When asked in a letter why the Zohar has had so much more of an influence on the development of Jewish thought than has The Guide to The Perplexed, Prof. Yeshayahu Leibowitz answered sharply: "Throughout all of history idolatry has been more influential on people than true faith has". I'm not telling you to agree, but I am saying that a rationalist not only can prefer rationalism to mysticism, but can - and perhaps must - reject mysticism outright as pagan superstition and mythological pseudo-philosophy dressed up as "spiritualistic" monotheism. I don't know if this is a good comparison, but anyway: a Rav of mine used to go through the Tanach with מפרשים every year (it's not so difficult, since 1 chapter of Navi and 1 chapter of Kesuvim daily is sufficient). I asked him which מפרשים did he prefer. He said, that sometimes he'll prefer an explanation of the Radak, or Rashi, etc. He wasn't rejecting any of the commentaries--he just thought that for a particular possuk, Radak had a better explanation than Rashi, or vice versa. I would like to say the same thing here--for example: I might not think a rationalist explanation of a particular mitzvah is always so intellectually satisfying, and I might prefer an explanation from the Zohar, the Arizal, or one of the Chassidic masters. Does that mean I'm engaging in idolatry or superstition? Another point: It's undeniable that the Gemara and Midrashim contain mystical elements in them: use of Divine names, amulets, etc. Even if the Zohar would never have been written/discovered, these mystical elements were already part of our tradition. The fact that Prof. Leibowitz (or any other rationalist thinker) is uncomfortable with them cannot make them go away. "How could my ideological opponents, who were far greater in Torah learning and intelligence than me"
Not quite. See this classic ("Not Me") by everyone's favorite Language Maven, Wm. Safire, ob"m.
Mazal Tov...may you have many, many more fruitful years! I think you have made a major contribution to the English-speaking religious community in giving us the "kelim' to deal with these questions and to confront the rampant extremism and anti-intellectualism of too many religious Jews. In my own case, I have also been greatly strengthened by my immersion in the thinking and work of the so-called "New TANACH Studies" which is centered in Michlelet Herzog, associated with Yeshivat Har Etzion. Although most of their work is in Hebrew, they have started bringing out English-language editions of "Torah MiEtzion" on the Torah. They emphasize a thorough understanding of the pshat of the TANACH along with an open attitude to historical, archaeological and scientific work that sheds light on the TANACH. Among the most prominent contributors to this field are Rav Yoel Bin-Nun, Rav Yaakov Medan, Rav Amnon Bazak, Prof. Haggai Misgav and numerous other. They will be having their annual five-day conference with dozens of shiurim given by the people associated with this school of thought and it will be attended by THOUSANDS of people, the numbers increasing each year. This shows that is is NOT true that all religious Jews have becoming more and more extreme and turning their backs on common sense and human knowledge. I find this very encouraging. Keep up the good work! 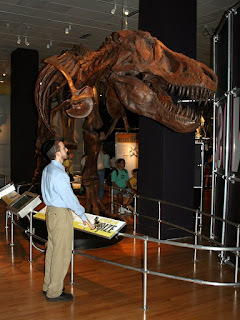 Because The Biblical Museum of Natural History hosts no dinosaur bones, everyone can own their own life size Tyrannosaurus skeleton at a very affordable price. Mazal tov on reaching this milestone. May this year be one of exceptional productivity and success, with good health and nachas from your family. And thank you for all of your hard work! Nah. I'll concede that "than I" is marginally acceptable, but only barely - with an imputed but quite virtual final "am". Much more soothing to the ear and transparently correct to stick with "me" here. Shades of the even more egregiously misguided "between you and I" police. Oh. and mazal tov on your new venture. Ha Ha you are on the dole too. Just like all those Chareidim that you hate so much. Litvak misses the mark completely. R' Slifkin demonstrates "what's mine is yours" by providing this blog gratis and "what's yours is yours" by requesting willing sponsorship through monographs, books, lectures and the museum. So too with religious scholars, secular scholars, artists, poets, orchestras and opera companies who earn their patrons' support. In stark contrast, those able-bodied men who choose to live "on the dole," be they chareidi or not, demonstrate "what's yours is mine" by taking charity undeservedly, by taking taxpayer-funded welfare intended for the involuntarily destitute, and by prostituting themselves politically for taxpayer-funded payoffs. I am afraid there will not be a resurgence of rationalist judaism, because a ruthless and honest application of rationalism does not leave much space for religion at all. Ask yourself why there are no scientific theories that involve God. Because ultimately a rational approach demands that you ask "how do I know?" and this question repeatedly comes up empty when asked regarding religious beliefs. In Judaism, the question, "how do I know" is answered by "it says so in the Torah/ Chazal / Rishonim". That is a rationalist answer. Science observes and explains the physical, and cannot go further than that. Would we expect an expert auto mechanic to know more than anyone else about the inventor of the car? That's why it's called "Rationalist *Judaism*" and not "rationalism." It is trying to be rationalist *within* religion, which has never been disproven by science, even if it's never been proven either. And, of course, there are some things science can't answer either, and never will. The best defence is offense. It is true that a consistent "rationalist" Judaism entails rejecting certain statements by Hazal as factually untrue and rejecting, to some extent, the accuracy of parts of the Torah with regard to historical fact. It is also true that a consistent "irrationalist" Judaism entails completely subverting the Torah's most basic premises, rigorous monotheism, worldly nationalism, and demanding ethics in favour of occult ritual, theurgy and fantasy. With the advance of academic research we now know that "Jewish" mysticism is essentially the revival of Tzedoki religion, mixed with various gnostic and Zorarostrian and traditions placed into pseudonymous "Rabbinical" works. There are, and always have been, good, honest obscurantists who cling blindly to every word of Hazal without having to reach for kabbalistic crutches, but it is, and always has been, mysticism that has given the irrationalist position vigour. We see today with our own eyes how people who imagine themselves to be followers of the Hatam Sofer give their children magic haircuts on Lag B'Omer. Without mysticism the Haredi position collapses under its own counterfactual weight. So, in short, this Sukkot set up a table at the Kotel with some tefillin and ask the passers by why *they* are willing to ignore the words of Hazal for hevel and rik. (Or, at the very least, start wearing tekhelet). Brocha V'Hatzlocha. Many blessings and best wishes for continued success. 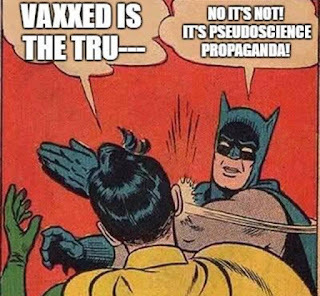 Regarding this post, I agree it is well written, but it is really not necessary at all to excuse oneself for pursuing rationalist explanations. "It might seem odd that someone such as myself is studying and writing and teaching about rationalist Judaism..." -- No, it is not odd at all, and on the contrary, this is completely imperative and the standard for any person, especially for anyone living in the times that we do, when society as a whole and we all as individuals reap so many benefits from the great successes of rational and scientific thought, which clearly is also absolutely necessary for gaining true understanding of the Torah and Hashem's will. One of the issues I would love to see addressed in your book is the evolution of Torah Study (if there was one) from an act of studying to learn about the reasons Hashem craeted the world and to guide one in his day to day behaviour to the act of studying as an act of worship. Also, when you say becoming a rationalist, do you mean an empiricist? I was reading a book recently and in philosophy I think the rationalists were different to what you mean by rationalist.